iPhone's Live Photo feature is really cool. It gives users a chance to grab the moment 1.5 second before and after taking the shot and thus make the picture more livelier with sound and movement. 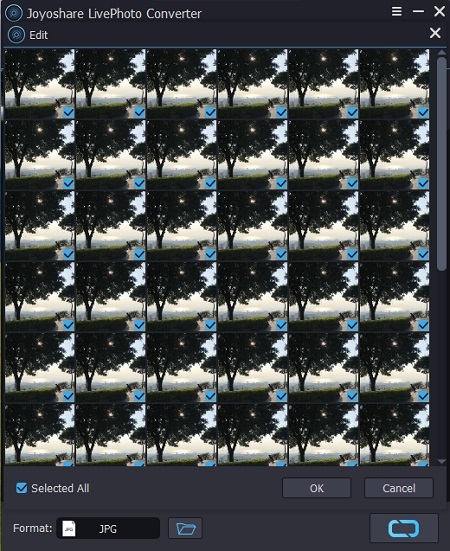 And the most wonderful part is that you can even pick the perfect frame from one Live Photo file that consists of dozens of still frames as you like. So, how to get a still image from a Live Photo? In this article, we'll introduce 3 simple methods to extract a single frame from Live Photo on Mac/PC, or on iPhone/Android flexibly. If you're wondering how to select a frame from Live Photo on Mac or PC, Joyoshare LivePhoto Converter for Mac (or Joyoshare LivePhoto Converter for Windows) will be the best assistant. This is a smart and professional photo converting tool that is capable of converting any Live Photo to GIF and other still images in JPG, PNG, BMP, TIFF, etc., easily and quickly. Not only Live Photos from iPhone, it also supports to convert Andriod Live Photos to other formats you like. 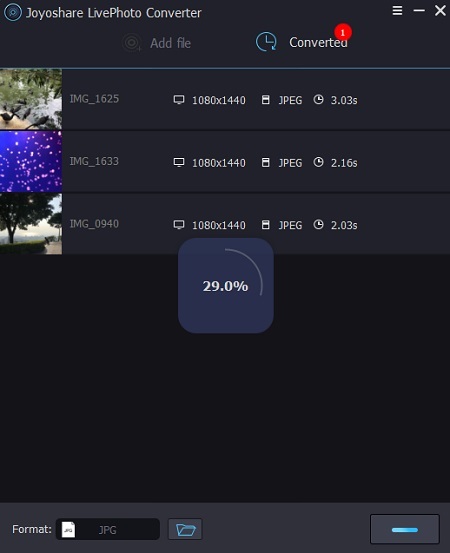 Joyoshare LivePhoto Converter enables users to extract any still frames from mutiple shots of a Live Photo file according to your preference. You can also preview the file in real time and select the ones you feel satisfied. Besides, you can choose to convert one live picture at a time or convert several files in bulk. Additionally, this poweful Live Photo converting tool also gives you freedom to edit the pictures before converting, such as rename the file, adjust the output quality, keep the aspect ratio, etc. 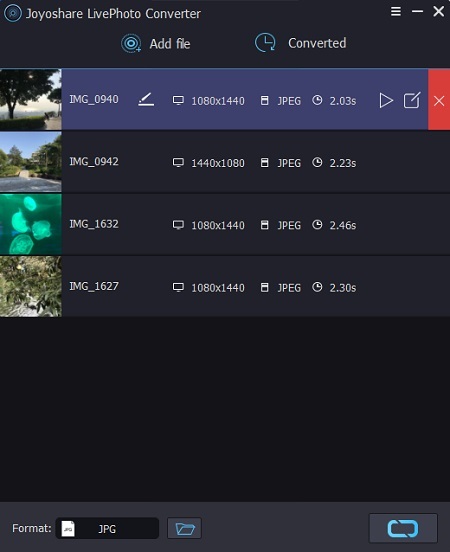 Next let's move to the detailed instruction on how to extract a still image from a Live Photo with Joyoshare LivePhoto Converter. Here we take a Windows version as an example. Use a USB cord to connect your device to the Mac computer, and then sync all the Live Photo you'd like extract still images from to the local folder of the computer. Go to the download page of Joyoshare and choose LivePhoto Converter to download and istall on the computer. 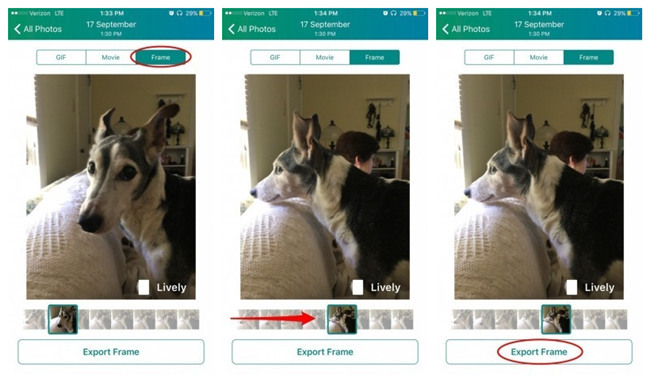 Simply open Joyoshare and then drag and drop the Live Photos to the app, or click the "Add file" icon to import them. Keep in mind that one JPG file and one MOV or MP4 file with the same name is called one Live Photo file, you need to add them both at a time. Click the Edit icon beside one Live Photo file and then you'll see dozens of frames about this file, you can now select the favorite ones at your own will. Then click the Format panel and set the output formats for your frames such as JPG, PNG, WEBP, BMP. etc. Afterwards, you can now press the "Convert" button at the lower right corner, and then you'll see all converted files in a second by clicking the "Converted" button. Step 4: Now slide the slider bar on the bottom and pick the best frame you like and then tap the "Export Frame" option and it will save to your Photos app automatically.